What I am going to do, is take some time to pray in preparation. As another liturgical year begins, this time around I hope to live it mindfully. And in the company of my readers. I was raised in the Christian Reformed Church – a denomination that falls somewhere between high and low church. Let’s call it middle church. This means that we had things like congregational readings, and we celebrated some aspects of church/liturgical calendar, but we didn’t go whole hog. I have since attended and been in leadership in Alliance churches, Baptist churches, and Pentecostal churches, but it wasn’t until I attended Regent College that I came into contact with full celebration of the Christian year. Ash Wednesday, Holy Saturday, Ordinary Time, Epiphany… I had a basic knowledge of what they comprised, but I’ve never actually lived them in a cyclical way. I’ve observed one feast one year, and maybe tried a different one in a following year, but I have never observed them sequentially. And I want to. “…the attempt to live the Jesus life over and over again all the years of our lives… It is about the spirituality of joy and suffering, of waiting and faith, of asceticism and celebration, of loss and hope that marks all our lives and that needs to be strengthened, deepened, revisited, and rediscovered in the life of Jesus and the life of the church every year of our lives” (xvi). “The liturgical year… proposes, year after year, to immerse us over and over again into the sense and substance of the Christian life until, eventually, we become what we say we are – followers of Jesus all the way to the heart of God” (6). That’s what I want to be (on my better days). So I want to explore this life – to orient my year around the life of Christ, rather than tie it to the earth’s rotation around the sun, or the cycle of education, or the yearly accumulation of finances, or the payment of taxes. I hope to write at least once a week (perhaps even more often, if I can manage a few regular posts here and there between the Christian year). Some posts will contain church liturgies (I also hope to use this year to explore what it means for a “non-liturgical” church to experience the Christian year). Some posts will contain explanations of different fasts and feasts. Some posts will track my personal experience throughout the year. Some posts will be biblical reflections from within a particular liturgical season. If there is a type of post you would find particularly helpful – or a question you would like me to research during the year, please feel free to post a comment and let me know. If you are interested in participating in this journey with me – let me know that too. Consider picking up Chittister’s book as a starting point, and prepare with me to ring in the New Year on November 27. ← Previous Post What’s Wrong with the Temple? Thanks Rod – I’ll take a look! I have the Chittister book on my nightstand – have only just begun, but would love to read it WITH YOU! Andrea, that would be wonderful! Thanks Kristi! I’ll check that out as well – it looks like a good read. Stacey, I look forward to your regular reflections through the church’s year. I share your interest to invite that rhythm into daily life (having been raised on the low side of church life) and to submit to the story we are part of, yet which is so much larger than any of us. Yeah!! So looking forward to your reflections on this Stacey! Hi Stacey, I am looking forward to reading your posts throughout the year as you follow the Liturgical year. I too have come to appreciate liturgy. There is, to me, a feeling of peace and strength in following a common church calendar. I found a good site that lists the Scripture readings for each Sunday and various comments about them. So by reading through the Scriptures weekly; I will begin the New Year with you this weekend. I’m glad to hear you’ve found a good site that gives you readings for each Sunday – are the readings taken from the lectionary? Which site are you using? Stacey, I’ll be ‘reading you’ through the year. What part of the journey do I want to read about? Everything! p.s. Louise (from Regent) sent me a link to your blog. Wonderful! Please do feel free to share from your readings – I’d love for this to become a communal experience. Welcome! Thank you. Celebrating Advent, not Christmas, was what led me to you :-) . I discovered Jesus’ birth may not be December, and from this began to notice the significance of the Feasts. I am with you all the way on this journey following Jesus all the way to the heart of God. I am MR. JOSE PAULO V. ESPINOSA, a teacher of High School Christian Living in St. Anne’s Catholic School Hagonoy, Bulacan 3002 PHILIPPINES and we are currently discussing the Liturgical Cycle. We would like to have an actual copy and model of the Liturgical Cycle. May we request your good office to give us a model of the Liturgical Cycle. Our school as well as the students will very much appreciate it if you will give us our simple request. Thank you very much. God bless. Thank you for reading my blog, Mr. Espinosa. I’m excited to hear that you are teaching about the Liturgical Cycle. Unfortunately, I don’t have a copy and model of the Liturgical Cycle to send you – but I can tell you where to look, based on my own scroungings from the internet. This blog gives a good overview of the liturgical cycle: http://experimentaltheology.blogspot.com/2010/04/liturgical-year-for-dummies.html. 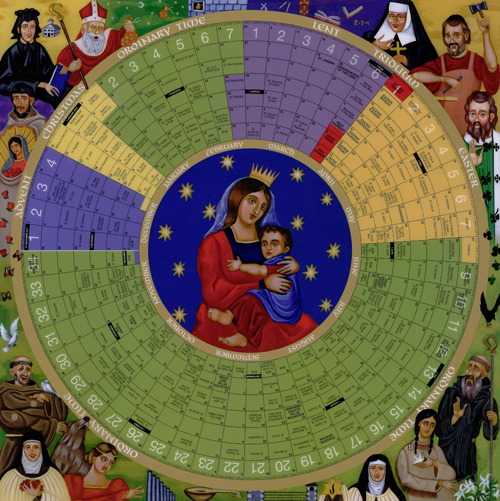 The circular calendar pictured on my blog is available here: https://www.catholicchurchsupply.com/catholic-gifts/year-of-grace-liturgical-calendar-2012-poster-laminated/sku/93222. I imagine if you contact them, they might be able to send you one for free, since it’s for educational purposes. It’s worth a shot, anyway! :) I also purchased a calendar recommended by one of my readers (http://thechristiancalendar.com/artists.htm), and have found that helpful. It is designed and produced by a church in Vancouver (http://www.uhill.net/). It is slightly different than the Catholic cycle, but again, there is a possibility that they would be able to get a calendar to you at no cost to your school. Sorry that I don’t have something to send you directly. I hope that one of these sites proves more helpful! Thank you very much, Ms. Stacey.